The UK is publishing Balance of Trade and Manufacturing Production but the US is not releasing any major economic reports. 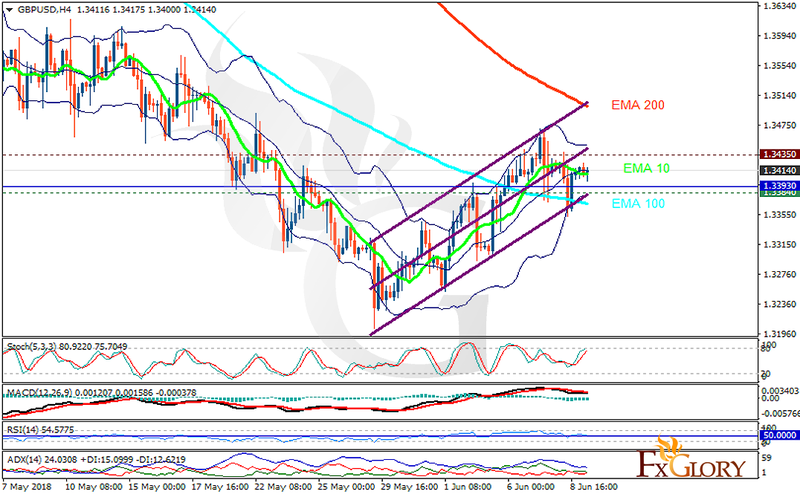 The support rests at 1.33840 with resistance at 1.34350 which the weekly pivot point at 1.33060 is located in between the lines. The EMA of 10 is moving with bullish bias in the ascendant channel and it is below the EMA of 200 and above the EMA of 100. The RSI is rising towards the overbought area, the Stochastic is showing upward momentum and MACD line is below the signal line in the negative territory. The ADX is not showing any clear signals. There are no clear signals for the price direction, therefore the pair will probably be fluctuating within the upper and lower Bollinger bands for today.